E05 Shut Up, Dr. Phil! E08 Season Seven, Time for A Wedding! "Dad wants us to pick up where he left off. Saving people. Hunting things. The family business." Supernatural is an incredibly Angst-heavy show based around a Monster of the Week structure topped off with an over-reaching arc, while simultaneously retaining humor through various means of Leaning on the Fourth Wall. It features Dean (Jensen Ackles) and Sam Winchester (Jared Padalecki), two brothers who hunt creatures based on Urban Legends, Classical Mythology and Judeo-Christian theology. 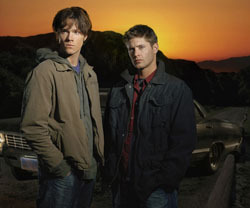 The first season featured the brothers searching for their missing father, but, for the most part, the series features them Walking the Earth as they travel from town to town in search of supernatural problems to solve. It uses a diverse score of classic rock songs that feature heavily throughout, to encapsulate the gritty rock-and-roll life they lead, and features Dean's 1967 Chevy Impala as almost a third character. It originally aired on The WB, but moved to The CW after the The WB folded. The sheer amount of Mood Whiplash it has. How it raised torturing its two leads (emotionally and physically) to a fetishistic art-form. A Spin-Off Web Original named Ghostfacers, centered around a pair of minor recurring characters from the series, was launched during Season Five, in conjunction with the show's 100th episode. Madhouse has recently begun making an anime adaptation of this show. You can look at the animation in action in this trailer. The American release of the first season of the anime came out on July 26, 2011. The show itself is currently preparing to air its eighth of the originally planned five seasons, with former writer of the show Jeremy Carver taking over as showrunner from executive producer Sera Gamble, who has been running the show since creator Eric Kripke stepped down as showrunner at the end of Season 5. There is an in-progress Recap page here. This page was last edited on 3 August 2018, at 14:53.